Overstrand beach01263 513811work BeachWhen the tide is out the beach is flat sand, great for building sandcastles, taking a nice gentle stroll or just relaxing in a deckchair. 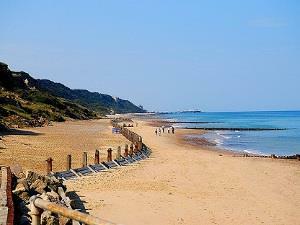 Walking is a popular activity in Norfolk and you can start the coastal circular walk or the Norfolk Coast Path from Overstrand. Both are scenic walks. There is an ice-cream van every day in the car park. •	The beach is accessed via a long gradual slope which is also used to launch some fishing boats. There is no vehicular access to the beach. •	It’s a lovely sandy beach once the tide has gone out and is quite mobile due to the action of tides, wind and currents. •	There is a designated dog free zone area from May to September. When the tide is out the beach is flat sand, great for building sandcastles, taking a nice gentle stroll or just relaxing in a deckchair. Walking is a popular activity in Norfolk and you can start the coastal circular walk or the Norfolk Coast Path from Overstrand. Both are scenic walks. There is an ice-cream van every day in the car park. There is a dog free zone on the beach from May to September with the exception of Guide Dogs.